Nestled in a peaceful valley alongside U.S. Highway 65, the town of Leslie is an attraction in itself. Pick up a guidebook and view Leslie’s 14 homes on the National Historic Register, or shop in the beautifully restored historic downtown which houses antique shops, charming cafes, and gift shops as well as other thriving retail businesses. Well known artists make their home in Leslie, as well as popular alternative and holistic medicine practitioners. Leslie residents are steeped in traditional Ozark folklore and folkways. Drop in on Saturday night for traditional music at the Ozark Heritage Arts Center and Museum or blues at Oak Street Station. Or find a warm welcome at one of the many celebrations and festivals: The annual June Homecoming, West Fest, Ozark Mountain Market and Fishing Derby, or the Sugarplum Festival. Follow the winding road for a friendly Ozarks welcome in Leslie. Where scenic Highway 7 meets beautiful Bull Shoals Lake, Diamond City is a planned community developed in the mid-twentieth century at the site of the old settlement of Dubuque, which was a steamboat stop on the White River. Retirees, entrepreneurs, and families looking for a leisurely lifestyle like the comfortable pace and natural beauty of Diamond City. Surrounded by the beautiful lake and mountain scenery, the area offers visitors excellent fishing, water sports, Corps of Englineers campgrounds, and boat docks, with unique locally-owned eateries and overnight accommodations for the more laid-back traveler. For permanent residents, a modern industrial park is home to several successful light industries. Diamond City residents invite you to come and stay for "a day, a week, or a lifetime" as you make it "your place on the lake." Formerly a mining town and now a hub for tourism and light industry, Lead Hill, Arkansas, is nestled in the heart of the Ozark Mountains on the shores of beautiful Bull Shoals Lake. Besides camping, fishing, boating, and swimming, parks and playgrounds near the water provide an ideal setting for a day’s outing for the family, with locally owned eateries and places to stay making the trip easy. Lead Hill’s caring community combines a safe and clean environment with a thriving economy, local educational opportunities, and rewarding activities for everyone from children to senior citizens. They are family-focused and celebrate Christian values with love of God and country, as evidenced by their spectacular annual Fourth of July Celebration and their tributes to military veterans. Located at the intersection of busy U.S. Highways 412 and 62, Alpena, Arkansas, has a charm of its own. Formerly Alpena Pass, the town’s roots lie in the building of the Missouri-North Arkansas railroad through Boone County in 1908. Most of the town’s historic structures, many of them still occupied by local businesses, date from this period. Present-day Alpena is a haven for artists, craftsmen, crafters, and quilters, with many outlets for everything from hand-made quilts to chainsaw-crafted art to hand-made furniture. Just about anything can be found in the colorful outdoor flea market and well-stocked resale shops. The community is especially proud of its school, known for high achievement and award-winning science and agriculture programs. Jasper, Arkansas, is located in the heart of the Ozarks and Buffalo River Country on state Highway 7, listed in some places as the 13th most scenic drive in the United States. Now the county seat of Newton County, the town’s many historic associations include a strong Native American heritage, Civil War skirmishes, family feuds, and legendary association with outlaws Frank and Jesse James. In the 1970’s Jasper became the anchor community along the Buffalo National River, America’s first designated national river. Visitors to Jasper can find a wealth of things to do, from back-country hiking and camping to floating the Buffalo or watching the Elk that occupy the nearby river bottoms.The area is home to a thriving community of artists and craftsmen as well. All the amenities are provided with excellent locally owned restaurants, motels, and cabins. It’s a story that’s told over and over again in rural Arkansas. A beautiful setting, abundant water, mining assets, and rich natural resources attracted settlers, and the coming of the railroad near the turn of the twentieth century opened up the area for an economic boom. Then depletion of resources led to inevitable decline, helped along by gradual retraction of railroad lines in the mid-twentieth century. Visitors can tour the beautifully restored depot, follow the old railroad bed on foot to an abandoned limestone quarry that was world renowned for the quality of its stone in the early 1900’s, visit “the Narr’s” at Wollum and take the hair-raising walk across the narrow bluff, take a canoe trip on the Buffalo River, or buy some delicious smoked meats at Coursey’s or Big Springs Smoke House and Restaurant. The town of Shirley is firmly planted next to the Little Red River in Van Buren County. 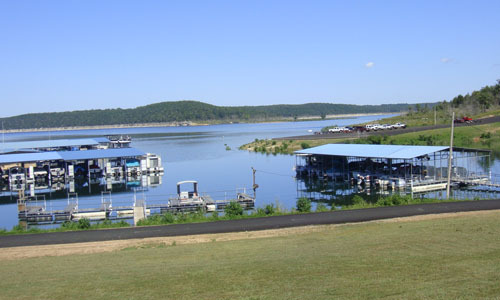 With Greers Ferry Lake just five miles away, the area attracts outdoorsmen, fishermen, and retirees. Getting to Shirley from any of three different directions involves about twelve miles of hairpin curves that challenge large truck drivers, thrill motorcycle riders, and amaze first-time tourists. Highway 9’s ninety-degree turn through the old downtown is a landmark. The town of Shirley was birthed 100 years ago by the coming of the Missouri and North Arkansas Railroad, which teamed with the bounteous white oak timber to provide industry for the town in its first three decades. The most visible reminder of the old railroad today is a unique railroad bridge over the Little Red River just blocks off Main Street. The one-lane bridge is open to adventurous vehicle traffic and provides a scenic photo opportunity. 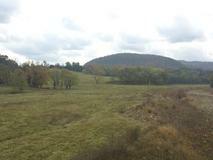 If you drive right through the small town of Norfork on Highway 5, you’ll miss a lot. Stop for a while and you can fish for a world record trout, tour the largest national fish hatchery, and visit Wolf House, the oldest public structure in Arkansas. Where the White and North Fork Rivers come together, Wolf House, still standing and beautifully preserved, was built in 1829 as a trading post and court house. The Trail of Tears passed near here. First settlers rest nearby in historic Wolf Cemetery. The town that grew up around the territorial outpost has quaint, friendly shops mingled with businesses serving visitors who come to try their luck at catching the rainbow, cutthroat, brown, and brook trout for which the rivers are famous. World record catches of all four species have been taken from the waters near here. Norfork’s permanent residents are civic-minded people whose efforts won them the title of “Volunteer City of the Year” in 2009. Fox is an unincorporated community located on a mountaintop in southwest Stone County. The rugged, heavily wooded terrain is bordered by the Little Red River and Meadowcreek on the west with Lick Fork and Turkey Creek meandering through the eastern boundary. Education, religion, and music are important to the community. It is not unusual to find the area’s nine churches collaborating on joint revivals, musicals, and youth events. Rural Special, a K-12 school of 220 students, holds together this community made up of Fox, Meadowcreek, Mozart, Parma, Rushing, Sunnyland, and Turkey Creek. Community members helped build Old Main in 1946 and have nurtured, supported, and rallied for the school throughout its 65 year existence to forge a tradition of strong academic performance and inclusiveness among its students. The 1925 one-room school house at Turkey Creek is listed on the National Historic Register. Many early settlers to the area were shape-note singers and kept that tradition alive through music schools and singings. Early families on the isolated mountain also found entertainment through making mountain music on guitar, banjo, fiddle, and mandolin. Today the school’s music roots program keeps that tradition alive by providing free instrumental lessons to students. Take the winding road to experience the Ozark mountain community of Fox. The peaceful little community of Valley Springs has never been a center of industry, never exported a valued product. But one thing it has done very well for nearly a century and a half is education. Soon after the Civil War, three learning academies were established in Boone County, at Bellefonte, Rally Hill, and Valley Springs (all, incidentally, within the present-day boundaries of the Valley Springs School District). Around the turn of the century, Valley Springs emerged as the leader of the three, and in 1912 the Methodist Church established the Valley Springs Training School. In 1922 the first organized high school was started as a cooperative boarding school, where students did campus chores and worked a 160 acre farm to pay expenses. Students were paid 15 cents an hour for their labor. At the end of each month, expenses were pro-rated and students rarely had to pay more than $12 a month. The school grew and evolved over time so that now its pre-K through 12th grade campus, with a mixture of modern and historic buildings, houses one of the highest performing academic programs in the state. The town itself remains a small, close-knit farming community that loves its school and proudly supports its Valley Springs Tigers. Follow the winding road to Valley Springs, a community that enthusiastically supports education and a school where best practices in teaching produce some of the most accomplished students around. Consolidation and change are keywords of the past and possibly the future of the Bruno-Pyatt school and community. In the frontier era, a one room log school house existed near the old Bruno cemetery. In 1887, two schools were erected on opposite banks of Hampton Creek. These schools eventually merged to form the Bruno School District. An Olympic sized outdoor swimming pool, arched doorways, and a vocational agriculture center were features of the 1920’s formed district. The agricultural school was the first west of the Mississipi River, and despite three consolidations the Bruno Lincoln FFA program has retained the chapter name and remains one of the oldest chapters in the region. 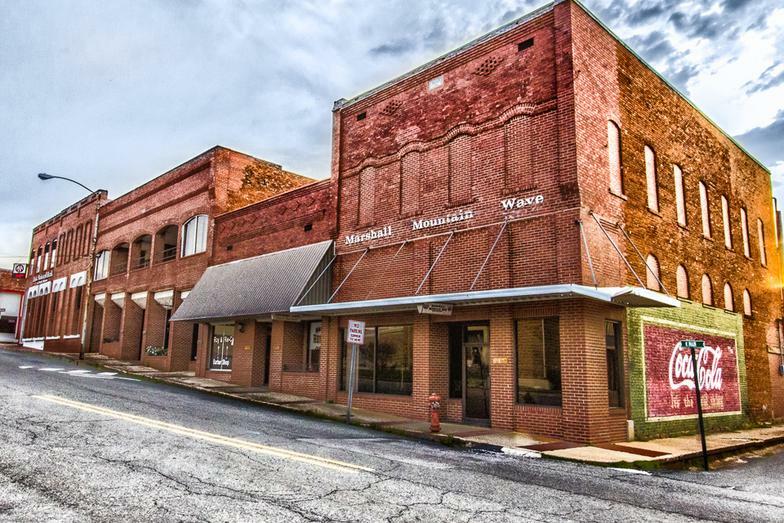 In the early 1900’s, Pyatt was a bustling little railroad town with a cotton gin, gristmill and general store. (The town was actually named after a construction engineer for the railroad). A one room school house was located in Powell, a small community that bordered Crooked Creek. The Pyatt school was constructed in 1926. The rock and concrete buildings sat on a picturesque hillside surrounded by a rock fence. The relocation of businesses and shifts in population continued to change the Bruno and Pyatt communities throughout the 50’s and 60’s. Bruno and Pyatt schools voluntarily consolidated in 1973. Today, Bruno-Pyatt exists as one of the schools administratively consolidated in the Ozark Mountain School District. The total school enrollment is less than 300 students in grades K-12, but its isolated situation makes it the most cherished institution in the area. Follow the winding road to a community’s cherished treasure, the Bruno-Pyatt school. Drive down winding Highway 66 between Leslie and Mtn. View in western Stone County and the road will open up into the wide and beautiful Timbo Valley, home to the small unincorporated community of Timbo, Arkansas. Timbo is comprised of the communities of Alco, Blue Mountain, Fairview, Flag, Newnata, Roasting Ear Creek, Round Mountain, Pleasant Hill, and Onia. Businesses located in the Timbo area are Blue Mountain Woodworks owned by Paul Gillam, Timbo Dairy Bar run by Robert and Jimmy Caston, Timbo Grocery owned by Lance and Linda Amis, and the Newnata Tire Shop owned by Letus Avey. Timbo Elementary and Timbo High School are located in the community. The mascot is the Tiger. There are around 200 students, which limits class size so students receive an excellent education here. Timbo is known particularly for its strong tradition of old-time music. Music legend Jimmy Driftwood lived there. Other folk artists—Bookmiller Shannon, Lonnie Avey, Andy and Caroline Rainbolt, Ollie Gilbert, Jurd and Eathel Treat, Glen and Nellie Branscum, Kenneth and Walter Gosser, Dicie and Lucy Johnson, Coleman and Sue Gammill, Jimmy Bullard, Guy Gammil, and Danny Lemay—were instrumental in making the Ozark Folk Center a reality. In 1959 Alan Lomax recorded music in Timbo, as well as in Heber Springs, Hughes, and Landis. Mt. Judea is a scenic, friendly place to visit and live. Although it is a small unincorporated town, it has a big heart. For the most part it is off the beaten path and yet has several highways going through or near it. The junction of highway 123 and highway 74 is located at the edge of town. Mount Judea has a US Post Office, a general store & gas station, a cafe, a clogging studio, a computer repair store, and a small rural school where the student to teacher ratio is so low that students get a lot of personal attention. The school is the major employer in the area and other businesses include farms, sawmills, and small home run businesses. If you are looking for a place to “get away from it all”, Mt. Judea is it. In a valley surrounded by tall mountains, winding waterways, and forests, Mt. Judea has something for everyone. Residents are often seen riding their four wheelers or horses. In the summer they go to the creeks and Buffalo River to cool off in the water. Canoeing and fishing on the Buffalo is a favorite pastime for residents and vacationers. Those who are more adventurous go to the mountains to climb at either Sam’s Throne or Rock Gap. This picturesque Ozark Mountain town was named after John Marshall, who, according to Ernie Deane’s Arkansas Place Names, was one of the most influential men in American history. He we related to the Lees, Randolphs and Thomas Jefferson, all of Virginia. Marshall was secretary of state under President John Adams and was appointed as chief justice of the U.S. Supreme Court. ​ Marshall is a great base camp for any Ozarks trip. It provides access to the Buffalo National River and the Ozark National Forest, both of which are just minutes away. Sounds of wildlife, mountain scenery and beautiful color in the spring and fall are just a few reasons to come visit. ​ Perhaps the most recognizable historic landmarks in town is the Kenda Drive-In, the only year-round operating drive-in movie theater in Arkansas. Marshall is also home to the Searcy County Library (named a “Star Library” in 2011, one of only two systems so named in the state). And is boasts a modern airport with a 4,000-ft. lighted runway. 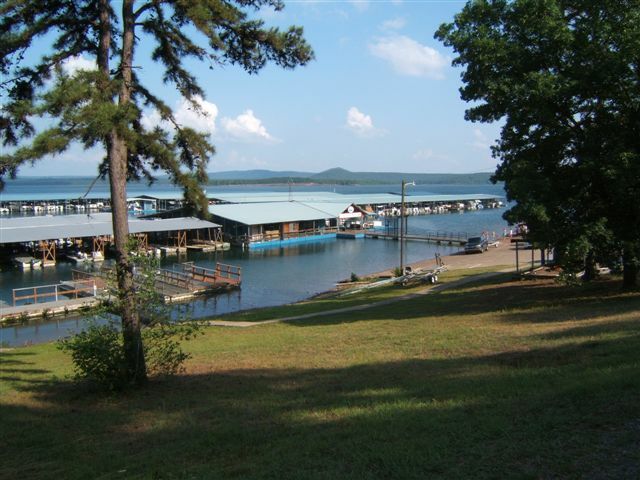 Nestled amongst the Ozark Mountains and situated on the banks of the 40,000 acre lake, Fairfield Bay – Ozark Mountain Lake Resort & Community - is located 75 miles north of Little Rock. If the stunning mountain scenery, championship golf course, lake, marina, arts center, varied events AND friendly residents don’t wow you, the value will. Countless amenities are part of the outdoor resort lifestyle in Fairfield Bay, including fishing and boating on scenic Greers Ferry Lake, teeing off on two 18-hole championship golf courses, hiking Sugarloaf Mountain – the first designated National Scenic Trail in Arkansas – and exploring the historic boulders and caves at Indian Rock. There are 8 championship tennis courts, 3 resort-style pools, fitness center, library, art galleries and more than 100 miles of hiking and bike trails - ALL in a mild climate that makes it the ideal location for year-round memories. The community holds some of Arkansas’ most unique festivals: Bloomin’ in the Bay (May), Surf the Bay (June) 4th of July festival (July) and OktoberFest at the Bay (Oct). Witts Springs, Arkansas, is a small community located on AR Highway 377. It is the most convenient entry point to the Richland Wilderness Area of the Ozark National Forest. There is a spring east of town with a stone having the name "Witts” carved in it. It is suspected that an early pioneer stopped at the spring and carved his name on the rock. For later travelers it was both a guide and a place to camp where there was fresh water. When the town was established in 1817, it was given the name Witts Springs after the name on the rock by the spring. The first grist mill and flour mill were built around 1888 about 1 ½ miles east of the present town. In 1892 a combination grist and flour mill and crusher from Blanco on Calf Creek was moved to Witts Springs. A sawmill and shingle mill were added as well. The first church was in an old mill house remodeled and dedicated in May, 1895. There was a school before the Civil War, but who taught is unknown. The community had a hard time thriving due to lack of economical ways to get produce to the market. But the roads were finally improved. Now much of its commercial activity revolves around forestry, farming, and its access to the national forest.